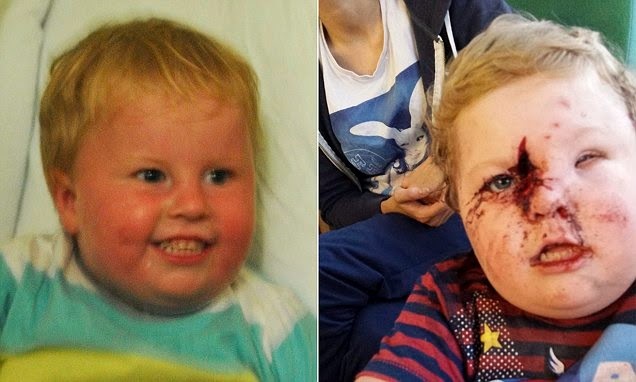 A two-year-old boy suffered horrific facial injuries when he was mauled by a family's pet bullmastiff as he played in the kitchen of his mother's boyfriend's home. Ollie Cummings was standing next to the dog as it was eating when it suddenly turned and began biting his head. 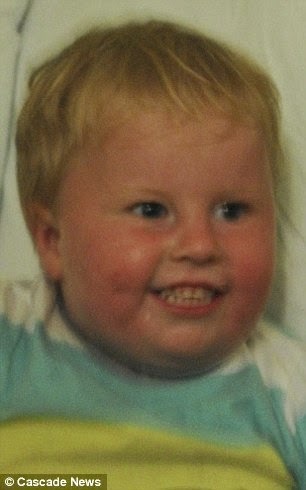 The toddler was left with a deep cut across his face and has undergone surgery to rebuild a section of his nose. His mother, Natasha Wilson, 25, snatched her son from the dog's teeth before calling an ambulance to the Dundee home on Friday night. The two-year-old was taken to Ninewells Hospital where he underwent a two-hour operation. He will need further surgery when he is nine or 10 years old. Speaking from hospital, Ollie's grandmother, Debs Martin, 48, said: 'Ollie had been playing with some keys, walking from one door to another pretending to lock and unlock them. 'It all happened so fast. We're not sure if he maybe dropped the keys next to the dog. There are teeth marks on his head and a large cut from his nose to near his eye. She said that her grandson, who celebrates his third birthday on November 23, was used to being around the dog. She added: 'He's not been fazed or scared by what happened. The dog was taken straight to kennels by its owner who is adamant it will be put down. The law concerning dangerous dogs was toughened up in Scotland earlier this year, giving new powers to local councils and requiring better registration. Dog attacks in the UK are one of the most common causes of severe facial lacerations in children. Each year, approximately 28,000 facial dog bites are reported in the UK, with just over 19,000 of them requiring some degree of plastic surgery.